Read. Engage. Apply. 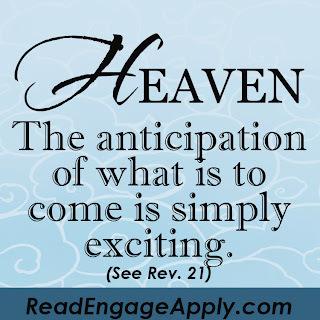 : What Waits for You In Heaven? Do you ever wonder what eternal life will be like? 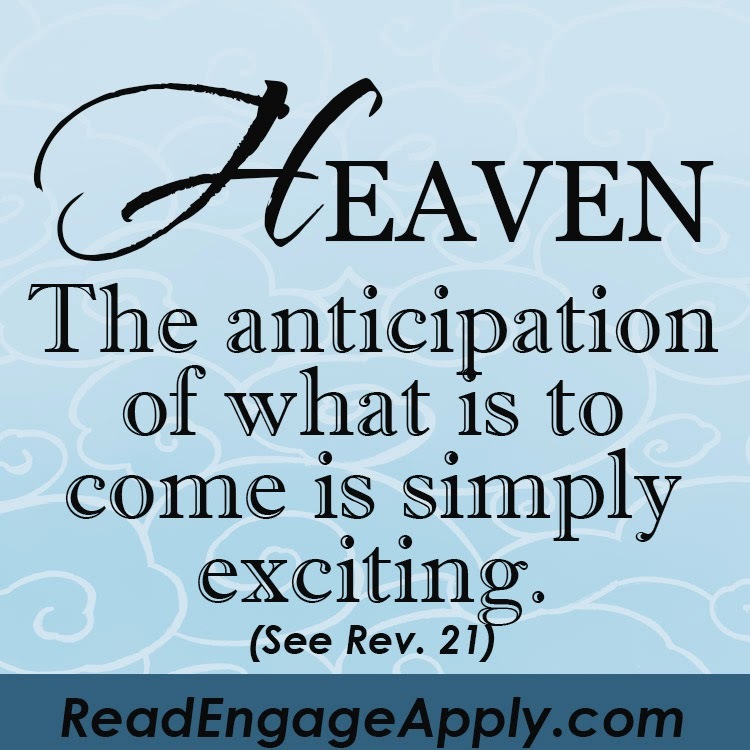 Or have you thought about what Christians will receive in Heaven? In working on my new book Heaven & Hell: Are they Real?, I built a list of 10 things that will greet Christians as they step through death and into the door of Heaven. 1. We will get our first glimpse of our Savior. Stephen was being stoned to death when he caught his first glimpse. Despite his dire earthly circumstances, he exclaimed with wonder and awe, “Look! I see the heavens opened and the Son of Man standing at the right hand of God!” (Acts 7:56) That same sense of wonder and awe awaits us. 2. We will be escorted to our heavenly destination by angels. In the middle of his story about an encounter between a rich man and a beggar named Lazarus, Jesus offers this tantalizing description: “So it was that the beggar died, and was carried by the angels to Abraham’s bosom” (Luke 16:32). When Jesus’ followers go to heaven, they go in style. 3. We will enjoy a private reception with Jesus. As Stephen felt his life slipping away, he made one simple yet profound request: “Lord Jesus, receive my spirit” (Acts 7:59). Is it a stretch to suggest that Jesus honored his request – or that the Lord personally welcomes all of his faithful servants into eternity? 4. We will break free of the curse once and for all. Revelation 22:3 reveals that the curse that God placed on his creation as a result of Adam and Eve’s sin in the Garden of Eden will be lifted in heaven. For the first time, we will be able to experience God’s creation as he intended. 5. We will discover what it is like not to suffer. 6. We will experience the joy of the Lord. 7. We will be welcomed into the presence of God. In the Old Testament, God’s presence was accessible only to a select few, at very specific times and under extremely restrictive conditions. That will not be the case in heaven. “Behold, the tabernacle of God is with men, and He will dwell with them, and they shall be His people. God Himself will be with them and be their God” (Revelation 21:3). 8. We will serve him. “His servants shall serve him” (Revelation 22:3). If that prospect seems less than appealing, consider this: we were created to serve him. In heaven, we will know what it is like to find true fulfillment and soul-deep satisfaction in our work. 9. We will become like Christ. The apostle John explains it this way: “Beloved, now we are children of God; and it has not yet been revealed what we shall be, but we know that when He is revealed, we shall be like Him, for we shall see Him as He is” (1 John 3:2). 10. We will spend eternity with our Creator and our Savior. At the heart of the most-quoted verse in all of Scripture is the guarantee that our fellowship will never end: “For God so loved the world that He gave His only begotten Son, that whoever believes in Him should not perish but have everlasting life” (John 3:16). Everything that is wrong in this world will be made right in heaven. Rather than dread the end of our time in this world, we can eagerly anticipate a place where the things that really matter will be the only things that matter.